What is a VFD and How Does It work? that the rotating device which the motor is driving delivers the optimum results based on the required RPM, while at the lowest energy demand. machining centers and many other rotating devices. manufacturing sectors had any need to use air to blow water or debris from their production lines. The p.c. board manufacturing industry in the 1980’s was busy trying to keep up with their explosive growth at the start of the new personal computer age. The standard for cleaning boards after automatic soldering machines was liquid Freon, a CFC compound that was an effective and instantly evaporating cleaning agent. 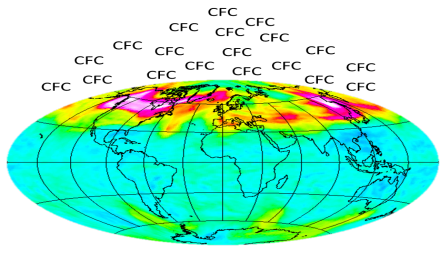 It was soon realized that the massive amounts of Freon being used for cleaning was inflicting enormous damage onto the earth’s protective upper atmospheric ozone layer. The Montreal Protocol addressed this urgent problem head on and water based, non-CFC cleaning alternatives were implemented throughout the p.c. board industry and others during the late 1980’s. 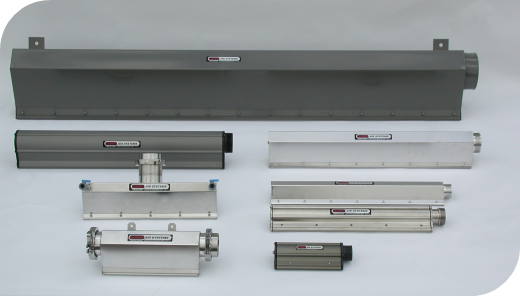 As the need for ways to blow water based cleaning solutions off manufactured products grew, most industries initially chose the lowest cost and easiest to install water blow off devices they could find. Many of these early users bought or made air knives and air nozzle designs which were powered by their factory’s existing high pressure compressed air systems. Subsequently, the very high electricity demands of most compressed air blow off equipment became more widely understood and the search for energy efficient alternatives to those began. 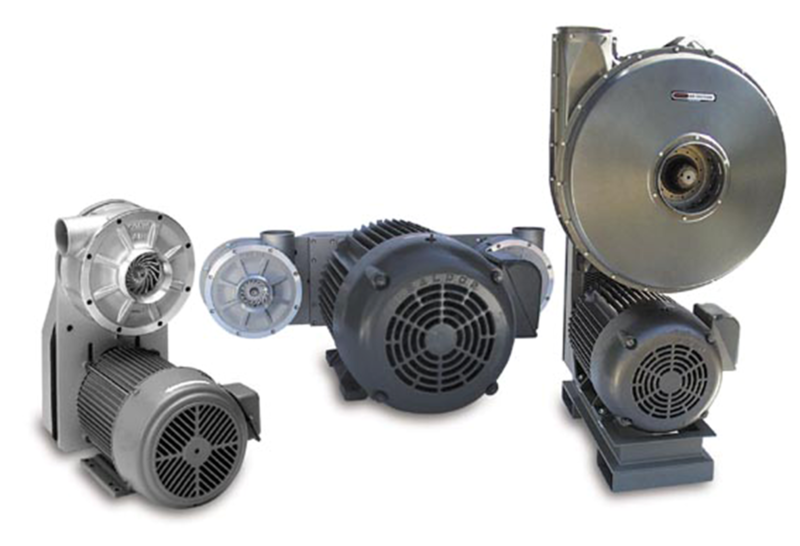 Now, with a variety of manufacturer’s to choose from, the common benefit of the blower air knife system is their 75% lower electrical consumption versus most compressor powered blow off devices. The majority of systems today utilize 3HP to 50 HP compact, high RPM centrifugal blowers with air flows of 200 to 3000 CFM at 1 to 3 psig air knife pressures. These are available with either high speed belt and pulley drive design powered by 2-pole, 60Hz, 3600 RPM motors or with direct drive blower motor assemblies utilizing ultra-high frequency VFD systems to operate A/C motors at speeds up to 20,000 RPM. Although air knife systems are now used in virtually every industry, high volume food and beverage filling and packaging facilities represent the largest market for air knife systems of any industry. 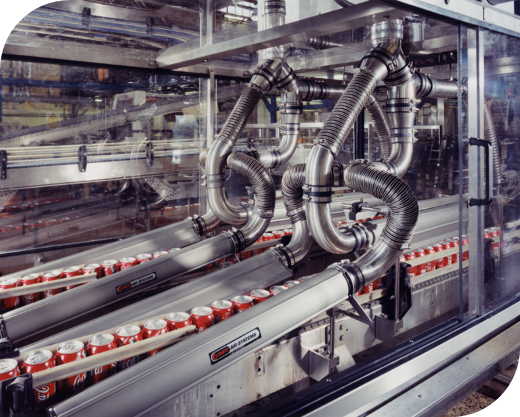 Most food and beverage plants have computer based systems to monitor, control and adjust to every aspect of each production line with multiple VFD’s serving several key roles for a wide range of motor driven machinery. However, the VFD’s with the highest power demand within many of these factories are often those operating blower driven air knife systems used after washing, cooling, warming or prior to labeling, ink jet coding and packaging. Some production lines, having changeovers for multiple products, usually have a PLC which interfaces directly with the blower VFD to automatically deliver real time air knife velocity control, based on production rates and specific package sizes, while optimizing the drive motor’s electrical operating cost. When VFDs are added to a blower powered air knife system in these cases, the exit air velocity can be adjusted to use only the precise amount of air knife force needed for the blow off work being done while maximizing the total system efficiency for each production line condition. These are considered a proper use for VFD controllers. Although a VFD can be the most efficient method for air knife velocity control, there are many situations where the VFD has been misapplied, or at the very least serves only as an expensive motor starter. The results can either be a host of unintended consequences or just a much longer return on investment than was used to justify its original purchase. This is particularly true if the VFD is chosen simply as an alternative to a magnetic motor starter. This means that the production line runs almost steady state and the driven motor will remain at 80% of full speed or higher for the majority of its operating time. It is always recommended before committing to the integration of a VFD in a factory, particularly to power a blower with a 10Hp motor or larger or with multiple blowers and VFD’s, that an electrical engineer review the entire job site. This includes installation, cabling, operating plan and electrical power supply to ensure the compatibility and highest reliability of each VFD, the motor being driven, and all other plant equipment associated with and/or operating around it. having the VFD manufacturer supply or at least recommend the specific motor for each installation can eliminate any questions of compatibility if problems occur. ESD (electrostatic discharge) primarily affects the internal surfaces of the motor bearings as the electrical energy in the rotor travels through the bearings to the motor’s casing which is grounded. This high frequency electrical arc across the bearing surfaces causes “frosting and fluting” which decreases the normal operating life of the motor bearings by a significant percentage. Extra care must be taken with grounding procedures and proper cable shielding to minimize these conditions. The presence of EMI (electromagnetic interference), as enhanced by a VFD’s high speed internal D/C voltage modulation, can disrupt the signals of nearby low voltage equipment, sensors or mobile communication devices with one telltale sign being a “whining” noise from the VFD. Installing VFDs with properly shielded cables and enclosures, or with added distance between other sensitive equipment can solve this issue. require power conditioning equipment, a dedicated electrical circuit and/or strict adherence to the type and length of cabling required into and out of the VFD. Overheating of the VFD or the driven motor can be caused by one of several reasons. Excessive heat will always shorten the operating life of VFD components or that of the motor, so an electrical engineer should diagnose each situation and recommend corrective actions thereof. Resonant frequency vibrations can develop at certain RPMs below the motor’s rated operating speed as the Hz settings on the VFD are reduced. Although the resonant frequency vibrations do take place in direct drive blower/motor units, they are generally much more severe with any v-belt driven blower/motor assembly because multiple components are rotating at differing RPMs thereby creating vibration spikes at specific critical component speeds. Blower V-belts can act as a shock absorber for these resonant frequencies, but then the shock absorber (the belts) will themselves need to be replaced much more often. It is extremely difficult to determine at what Hz settings on a VFD the resonant frequency vibrations will occur. Many times, the resonant frequency spike happens only as the blower slows down or speeds up on command from the VFD, so the operator doesn’t even know it is happening. 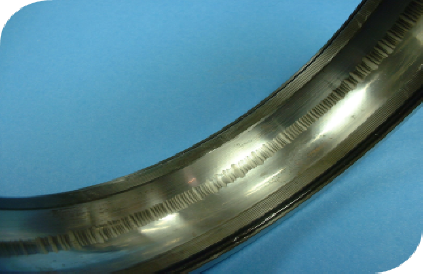 The bottom line before adding VFD’s to any blower/motor for air knife systems, is that the user must be aware of a wide range of factors which could result in unintended consequences, higher repair and maintenance expense and the corresponding increase in their total cost of ownership over the long term. The use of an automated air flow control valve on the outlet of a blower powered air knife system can respond to several of the same PLC signals that a VFD can. However, that is where the similarities end as the air flow control valve can offer some significant benefits over VFD motor controls. the air knife system’s performance objectives along with the variables in their product mix and conveyor speeds. This will allow the air knife system designer to size the air knife performance to the minimum horsepower and cost necessary to achieve the desired blow off results at the highest production rates and/or with the most complex product geometries. 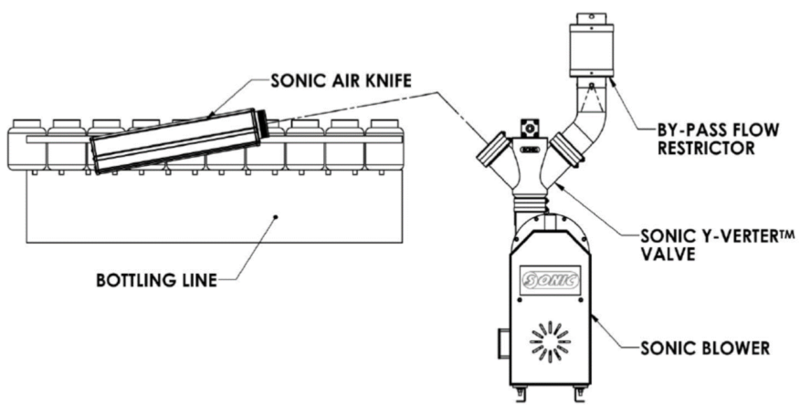 The second requirement is then to have an effective and repeatable method for air knife velocity control for all other production line variables which require either a reduced air knife velocity or for the air to be shut off completely, such as during planned or unplanned production stops as commonly occur in many food and beverage conveyor lines. If the production line speed or product complexity is reduced then the flow from the air knives can be switched to the lower air velocity mode. Whenever the product flow is interrupted and the air knife needs to shut off, regardless if it’s only 3 or as many as 20 times per hour, the automatic air flow control valve can immediately divert all of the air completely from the air knives. In the air divert mode, the blower continues to run at its normal speed while total blower air flow is reduced to only 25% which is then discharged through the air by-pass outlet from the air valve to atmosphere thereby reducing the motor amp load by 50%. There is no VFD “lag time”, so the air knife air is instantly shut off by the line sensor signal and then instantly resumes full air knife velocity at the moment when the line sensor signal is received. Another condition that is better suited to an air flow control valve, instead of a VFD, is when the production line requires only two air knife velocity settings. The high air velocity point is needed for the largest product or fastest line speed and then a lower velocity setting for smaller, slower or more delicate products passing through the air knife zone. Likewise, the high air velocity point doesn't have to be the maximum possible, but can be set to only as much as needed. This allows the blower volume and corresponding motor amperage draw to be reduced for peak efficiency at the high operating point, similar to the benefits of a VFD set at 80-95% of maximum Hz. There is no dispute about a VFD being the most efficient motor control system but, with the air control valve being only a few percentage points less efficient for most operating conditions, the low cost, ease of installation, rapid response and much lower long term cost of ownership all make for a strong justification for the air control valve assembly. The air control valve option has no delay in response time and can cycle on and off without limitation to the number of cycles per hour or per shift. 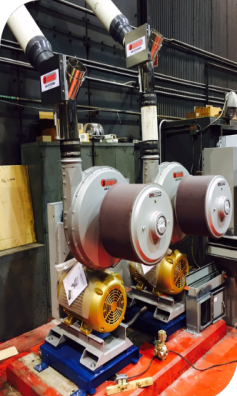 The motor runs at a constant 50 or 60 Hz and 3000 or 3600 RPM while the amps cycle up or down in response to the blower air demand signals from the production line. Although it is true that a VFD can reduce power demand by up to 75% in the “turn down” mode, these low flow/no flow air knife modes represent a very small percentage of normal production cycles for most factories and the true operating cost savings is therefore much less. As an example, a 20Hp 60Hz, 460V motor at full air knife velocity runs at 28 amps. When the air diverter valve shuts off the air knife flow the motor amp load drops by 50% to about 14 amps. By comparison, a 20Hp with VFD control would be turned down to approximately 30Hz, which reduces the motor current to approximately 7 amps. Assuming that this low flow air operating condition represents 10% of a typical production day, the approximate electric savings of 4.2Kw/Hr for each 8 hour shift, 5 days a week would take 10,000 to 15,000 total operating days to pay for the extra $5000 purchase price for the VFD rather than air control valves. Even if the low flow/by-pass condition were 90% of the air knife system’s daily operating time, the 37 kW/Hr savings per 8-hour shift would still require more than 3 years to recoup the purchase price (material & installation) of the VFD. At the end of the application review, and before you make the equipment purchase, have the blower/air knife system supplier do an ROI analysis for what system each is quoting and then proceed accordingly.